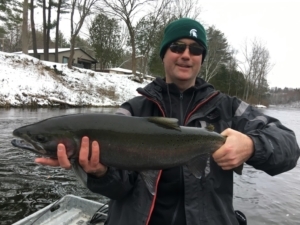 The Muskegon river fishing report for November 28, 2018 in the Newaygo, Michigan area continues to be centered on our fall/early winter steelhead run. With the onset of winter coming a few weeks early this year, we’re seeing the river come into “winter conditions” much earlier than normal. However, there are steelhead around to be caught and it’s a matter of covering water and fishing very specific runs correctly to find the biters. With both fly fishing and light spin tackle equipment, we’re able to target the water that steelhead occupy during such conditions and it’s simply a matter of “fishing smarter, not harder” ! The short term forecast is calling for some warmer temperatures come the end of the week and weekend, which can only help with snow melt and runoff, as well as the hope for a degree or two increase in water temperature. Click HERE for current weather information and forecast. Present water temperature is in the 38-39 degree range. Click HERE for up to date river conditions such as water levels and temperature.